Astronaut Edwin E Aldrin Jr, Lunar Module LM pilot, climbs down the LM ladder, preparing for his first steps on the moon. The year was 1969. At the end of a tumultuous decade that had begun in Camelot and was ending in a quagmire called Vietnam, three men, thousands of miles from home, were poised on the threshold of history. "Houston, Tranquility Base here. The Eagle has landed." These words were the capstone on the United States’ manned space program. Seemingly in response to President Kennedy’s challenge that the U.S. put a man on the moon before the end of the decade, LM pilot Edwin "Buzz" Aldrin and mission commander Neil Armstrong gently landed the Apollo 11 Lunar Module (LM) Eagle on the lunar surface. 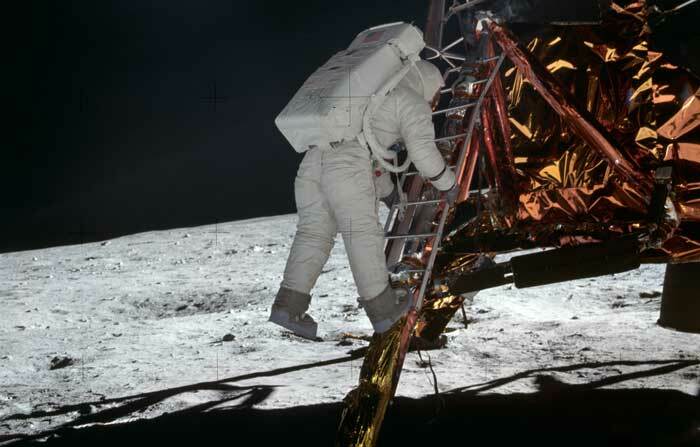 In the late hours of July 20, 1969, with millions tuned in worldwide via television or radio, Neil Armstrong slowly descended the LM boarding ladder and, with the now famous words, "One small step for man, one giant leap for mankind,"
"One small step for man, one giant leap for mankind,"
became the first person to set foot on the moon. Nearly 22 hours later, the LM returned Aldrin and Armstrong to the Apollo 11 Command Module where they rejoined pilot Michael Collins for the long ride back to Earth. In 1957, only 12 engineers were working on long-term, space-related activities at the Grumman Aircraft Engineering Corporation’s Bethpage, N.Y., facility. On October 4, 1957, these activities, as well as those at a myriad of aerospace and government locations, suddenly became focused on the near-term, as Russia initiated the "race for space" with the launch of Sputnik, the world’s first satellite. 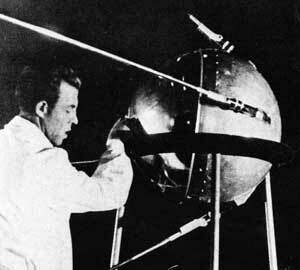 The Sputnik launch created shock waves in the United States. Imagewise, Sputnik spelled disaster for the U.S. In 1957 most Americans considered Russia to be “technologically challenged” or living in a technical Stone Age. The launch not only showed Russia’s ability to launch spacecraft, it meant that they had boosters strong enough to launch intercontinental ballistic missiles. The space race had taken on a new and much darker visage. In the words of one of those early Grumman engineers, “When the Sputnik came along, it just gave impetus to what we were doing…It was like being able to give the government a prod to do what you thought they should be doing all along." John Coursen, then Grumman Lunar Module program manager, recalls "It came up over the horizon exactly as scheduled, and absolutely amazed me…and it made me feel bad inside because it wasn’t ours. It was somebody else’s, and I couldn’t understand how they could do that and we could not, or had not." In 1961, the newly inaugurated president, John F. Kennedy, saw Russian missile advances as a direct challenge. While not ready to extend the existing space program through to the planned successor, the Apollo program, President Kennedy did approve development of a larger booster rocket, the Saturn. Several weeks later the Soviet Union again raised the stakes when it put the first human in earth orbit, Cosmonaut Yuri Gagarin. Shortly after Gagarin's flight, the United States put its first man in space on May 5, 1961. Although suborbital and not much more that a rocket enhanced toss of 116 miles, Alan Shepard's brief sojourn had a tremendous emotional impact. Unlike the Soviets, the United States allowed the world to watch Shepard's flight. With the successful recovery of Shepard and his capsule from the Atlantic Ocean, the United States entered what would become known as the space race. In a speech before Congress on May 25, President Kennedy announced his vision of the finish line to that race: "I believe that this nation should commit itself to achieving the goal, before the decade is out, of landing a man on the moon and returning him safely to Earth." "I believe that this nation should commit itself to achieving the goal, before the decade is out, of landing a man on the moon and returning him safely to Earth." Studies on manned space flight were now being conducted in earnest at Grumman. When interviewed for a documentary marking the 20th anniversary of the lunar landing, Thomas J. Kelly, who served as the engineering manager and eventually deputy program manager for the Lunar Module Program at Grumman recalled, "When the original idea of going to the moon was conceived, NASA hadn't really pinned down exactly how they were going to go to the moon... the details of how you were going to actually go out to the moon and return were undecided, even up to the point where the contract was let for the Command and Service modules." As the studies progressed, three approaches to landing and retrieving men from the moon were proposed: a direct ascent, an Earth orbit rendezvous, and a lunar orbit rendezvous. By mid-1962, the Grumman engineering team was convinced that the lunar orbit rendezvous was the best method. This approach called for the Lunar Module to orbit the moon attached to the Command and Service modules, then separate from them, descend to the lunar surface, and, when the mission was complete, to ascend and allow the astronauts to rejoin the remaining orbiting modules for the return trip to Earth. Kelly further recalled that “the lunar orbit rendezvous approach was selected because it was more economical. One of the main advantages...was that it allowed you to specialize the spacecraft...specifically, the Command Module could be specialized for re-entry which was a very demanding environment [and] the Lunar Module was able to be specialized for operations in space and on the moon." NASA was also convinced that this approach, which was originally derived by John Houboldt of NASA, was superior. Requests for proposals for a moon lander design were issued by NASA, with Grumman submitting its response in September of 1962. Joseph G. Gavin Jr., then a vice president of Grumman and eventual President of Grumman Corp., remembers the bid process clearly: "The request for bid on the Lunar Module was unique...in that it did not ask for a specific design. It was almost like a game of ‘Twenty Questions.’ You answer these questions, and if we think you know what you’re talking about, we’ll talk to you later." On November 7, 1962, NASA announced that the Grumman-proposed engineering concept had been chosen as the winning design. Eleven days later, a team of Grumman engineers was onsite in Houston. (The actual contract would be signed on January 14, 1963.) In March 1969, the first crewed mission of the Lunar Module took place; 2 months later, the Lunar Module entered lunar orbit for the first time. On July 20, 1969, the Lunar Module made its first lunar landing. During the Apollo Program, Grumman built 13 Lunar Modules, with six of those landing on the moon. 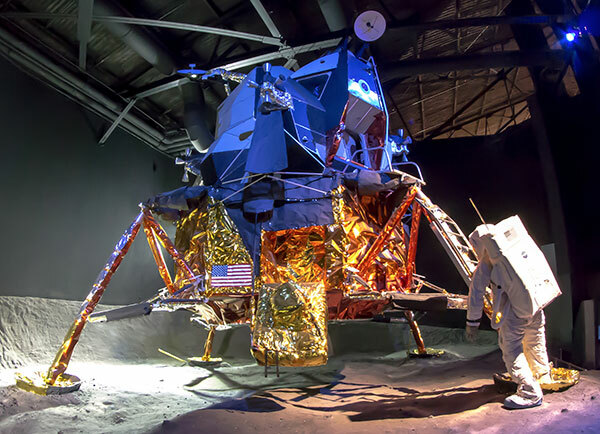 The 13th and final Lunar Module was never flown and is on permanent loan from the Smithsonian Institution to the Cradle of Aviation Museum. Said Kelly, "There was a dedication and a drive on the Lunar Module program that I haven’t seen equaled since. We’re talking about thousands of people here that were swept up in the enthusiasm and the historic importance of this endeavor. People who were doing some pretty routine and mundane jobs were doing it with great pride and great enthusiasm...Remember, there are six descent stages today sitting on the moon... with a "Made in Bethpage, New York" nameplate on them. And that’s something that thousands of Grummanites take great pride in." "Remember, there are six descent stages today sitting on the moon... with a 'Made in Bethpage, New York' nameplate on them. And that’s something that thousands of Grummanites take great pride in." LM-1 Apollo 5 22 January 1968 1st test flight. Verified ascent and descent stage propulsion systems in earth orbit. Designed for flight test–mission never flown. Now located at the NASM in Washington, D.C.
LM-3 Apollo 9 3 March to 13 March 1969 1st crewed flight to test the entire integrated system in Earth orbit. LM-4 Apollo 10 18 May to 26 May 1969 Test of spacecraft operations in lunar orbit. LM-7 Apollo 13 11 April to 17 April 1970 Mission aborted in trans-lunar phase due to loss of service module electrical power. LM-7 served as a rescue lifeboat for the astronauts. Backup spacecraft orginally scheduled for Apollo 15– never flown. Now located at the Kennedy Space Center, FL. LM-10 Apollo 15 26 July to 7 August 1971 4th lunar landing. LM designed for extended stay. Mission was cancelled and LM-13 is on display at the Cradle of Aviation Museum, Garden City, NY. The Lunar Module remains a true engineering marvel. To this day, it is the only crewed transport vehicle designed to function solely in the vacuum of space. Designed to land men on the moon and return them safely to the Command Module orbiting above, the LM was never flight tested because the lunar environment couldn’t be replicated. During the life of the Apollo program, 13 Lunar Modules were built by the then Grumman Aerospace Corporation (now the Northrop Grumman Corporation); of that number, six made lunar landings. The last in the series, LM 13, never flew; its mission (Apollo 18) was cancelled. Built on Long Island by Long Islanders, as all LMs were, it is now in its final resting place, the Cradle of Aviation Museum – on Long Island – where it serves as a permanent memorial to the men and women of Grumman whose dedication and technical expertise have made the Lunar Module an Historic Mechanical Engineering Landmark. Visit our Countdown to Apollo at 50 homepage for information about exciting events and celebrations.